For all the obvious positives there was a niggling little negative in Shamus Awards’ Cox Plate win last spring, one his trainer reckons he will shrug off at Flemington this Saturday. 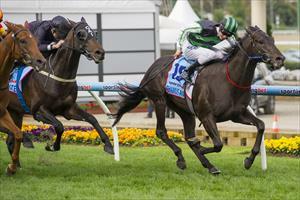 History will remember Shamus Award as the only maiden winner of the Cox Plate. “Maiden winner" was the headline but it detracted from the performance; an all-the-way win over the likes of Fiorente, who then went on to win the Melbourne Cup and is regarded as a WFA force after a first-up win in last Saturday’s Peter Young Stakes at Caulfield. O’Brien says Shamus Award has a season of racing to shrug off the shock maiden winner tag, to use that win as a springboard, beginning in Saturday’s Australian Guineas. “That’s why we’ve been absolutely single-minded about winning this Australian Guineas on Saturday," O’Brien said. “Winning one Group One is great but winning another is even more important, especially for the horse remembered as the maiden winner of the Cox Plate." Shamus Award might be worth $5 to $6 million at stud at the end of his four-year-old season if the Cox Plate is his sole Group One. But he would be worth double that, at least, if he can win the Guineas, a race that has launched the stud careers of Zabeel, Flying Spur, Pins, Reset and others. “Winning the Cox Plate is a great start and you can say anything you like about having a light weight and being a maiden but it was a mighty performance," O’Brien said. “Savabeel launched to a great stud career off it and So You Think won it twice and has been well received at stud," O’Brien said. “But the Guineas tends to launch stallions and we’re determined to win it." O’Brien said he was confident the scoreboard would count for something on Saturday. Hucklebuck, the warm favourite for the Guineas after an easy win in the C.S. Hayes Stakes at Flemington, did not contest the A-grade races last spring. Shamus Award is an $8 chance. “Let alone win a Cox Plate," O’Brien said. “If you go by ratings, Shamus Award’s form is simply head and shoulders above all his rivals on Saturday. “Not just the Cox Plate. All three runs were excellent, including the Caulfield Guineas, which he should have won." Shamus Award resumed with a tiring third behind Moment Of Change in the Orr Stakes. Eurozone, the horse O’Brien rates as the one to beat on Saturday, was second. “I wasn’t concerned at Caulfield. He did all the chasing. Everything he’s done since has been terrific. His work at Moonee Valley on Friday night was excellent. We’re confident." Shamus Award’s task was made easier yesterday with the decision from Solicit’s owner David Moodie that she would miss the Guineas and run in the Kewney Stakes a week later.